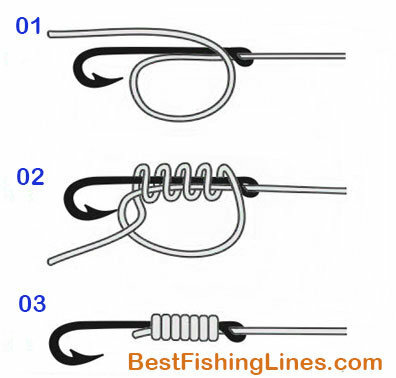 Tying a fishing hook is an important and essential skill of fishing. Ask any avid fisherman out there and they will tell you that the darkest day they can remember while fishing was when their day’s best catch got away because of a weak knot or faulty equipment. Knowing how to tie fishing hook can help you avoid joining the list of those who have caught and lost. This write-up will focus on some simple all-round Best fishing knot that are suited for different situations. The Palomar knot has over 95% strength mainly because it is double-run through the hook eye and knotted. It is a favorite knot for many anglers. i.Double fold 6 inches of line (over on itself). 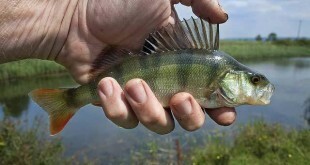 Then pass the folded line through the eye of the lure or hook. ii.Tie a simple overhand knot just above the eye of the hook, effectively leaving a few inches on the tag end of the line. (Avoid twisting the lines). iii.Pull the end of the loop down and pass it completely over the hook. iv.Moisten the line and pull its both ends to draw up the knot. (Trim any excess). The Palomar knot is thought to be the best knot for light fishing lines as it tends to retain much of the original line strength. The Improved Clinch Knot makes five turns before running through a loop. This makes it one of the strongest methods to tie a hook especially given that it retains 95% of the original line strength. i. Pass one end of the line through the hook eye or swivel (leave about 6-12 inches of line). ii. Leave a small space between the line and the hook eye and then twist the tag end around the standing line five to seven times. ii. Take the tag end and pass it through the small space left between the line and the hook eye. iv. Thread the tag end through the second loop (as created in step 3 above). v. Pull the tag end and the standing line slowly away from the hook. vi. Finally, moisten the lines with some water and pull through the standing line firmly away from the hook. This knot is quite popular especially with monofilament. In addition, it works quite well when connecting an eyed hook to a leader. i. Pass a line through the hook eye and double back so as to form a circle. ii. Tie a knot by wrapping the tag end around double line making six turns and put through the loop. iii. 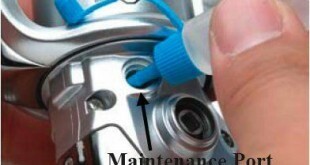 Moisten the line with some saliva or water and pull the main line to tighten the knot. iv. Pull the main line again to slide the knot down to the hook eye (or swivel). v. Lastly, trim the tag end and complete your knot. Don’t worry about cutting the end short with this knot. It will hold. The good thing about the hangman’s knot is that it is great to learn and it works very well with braided line. This type of knot is also known as the Kreh Loop because it was popularized by Lefty Kreh – a fishing legend. As its name suggests it forms a tight loop at the end of the fishing line. 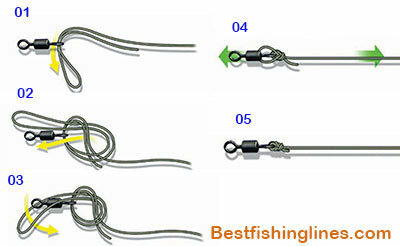 The non slip knot is best with larger lines where a tight knot can impede hook movement. i. 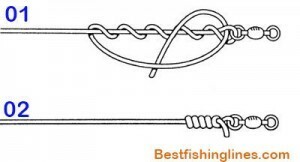 Create an overhand knot of about 10 inches from the end. Thread the tag end through the hook eye and then double back so that it passes through the overhand loop. ii. Then wrap the tag end above the overhand around the line for about five times. iii. Pass the line back through the overhand once more (entering from the same side it exited from). iv. Moisten the lines and pull slowly in order to clinch the wraps loosely together. v. Pull the loop and the standing line opposite-wise to seat the knot (trim the ends). If you are looking a spade hook you will notice it has no eye. For that reason you have to tie a knot next to the bent end of the shank. Normally, hooks are small and the knot tends to hold them perfectly in place. i.Create a loop of line over the hook bend so that you can then grip the loop together with the bend between your thumb and finger. 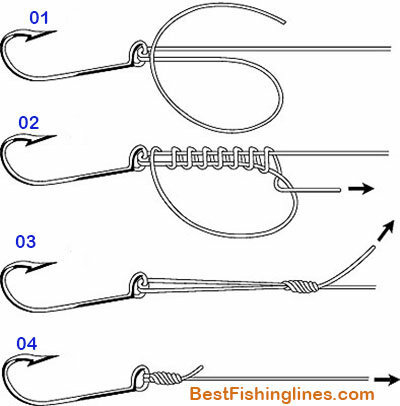 ii.Wrap the short end of the line 10 times around the hook shank. You can do this either from the bend to the spade or from the spade down to the bend. The first is much easier to master. ii.Swap your grip to reveal the loop and bend. Then pass the free line end through that loop. iv.Pull the free end of the line and the main line in opposite directions in order to tighten the knot. Moisten the line a bit before final tightening. (You may trim the loose ends). Note: It is important to ensure the line always comes from inside the hook over the front of the spade. Another way on how to tie fishing hook involves creating a snell (which in other words means creating a knot away from the hook eye). This simple strategy works well for any fishing assignment as it increase equipment strengths and improves catch rates especially with bigger fish. i. Starting with an up-turned eye hook, pass the line through the eye in order to create a large loop going along the shank. (Ensure the tag end lies along the shank). ii. Wrap the tag end over the hook shank and the line working (working from the point moving towards the eye). Do this repeatedly in order to make 5 – 10 wraps and then finally feed the tag end out through the loop moving from the underside to topside. (Note: Number of wraps depends on the size of the line and hook). iii. Hold the wraps in place and gently pull the tag end for a tighter grip. Cross-check to ensure the wraps are nicely formed and neat before finally pulling both ends very tight. Finally clip the tag end. For Best fishing knot – Practice, practice, practice is the keyword if you want to learn how to tie fishing hook. Always make sure you are able to tie a secure knot every time before you head outdoors. 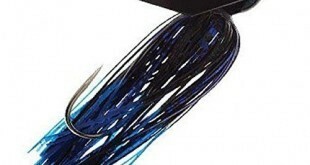 Remember, the weakest link between the angler and the catch isn’t the reel, the line or the rod. It is the knot joining the line to the hook.